Japanese singer Piko-Taro has made a Guinness World Record - his viral ditty PPAP (Pen-Pineapple-Apple-Pen) is the shortest song to chart on the US Billboard Hot 100 charts. On the chart dated Oct. 29, the 45-second PPAP debuted at No. 77. The 53-year-old received the Guinness award at a press conference in Tokyo on Friday. His track rewrites the mark set in 1964 by American folk band The Womenfolk for the song Little Boxes, which was one minute and two seconds long. Piko-Taro, who is the first Japanese artist to chart on Billboard since 1990, announced that he has signed on with record companies such as Sony, CNR Music and Time Records to distribute his future music around the world. The song is simple: Piko-Taro, while donning a garish animal-print outfit, imagines fusing an apple, pineapple and pen in different permutations. The video, first uploaded in August, has since gone viral with at least 200 million views across various YouTube accounts. Piko-Taro said Friday that the song was produced on a budget of just 100,000 Japanese yen (US$950). It has since produced numerous parodies and covers, while Piko-Taro has also uploaded a separate video tutorial on the PPAP dance moves. In a tweet last month, Canadian pop star Justin Bieber said that PPAP was his "favourite video on the Internet" and posted a link to the clip. The tweet has since been retweeted 66,300 times and liked 122,000 times. Piko-Taro - the alter ego of Japanese comedian and DJ Daimaou Kosaka, whose real name is Kazuhiko Kosaka - has termed his style of musical comedy "piko-pop", which he called a cross between Japanese oldies and old-time music. 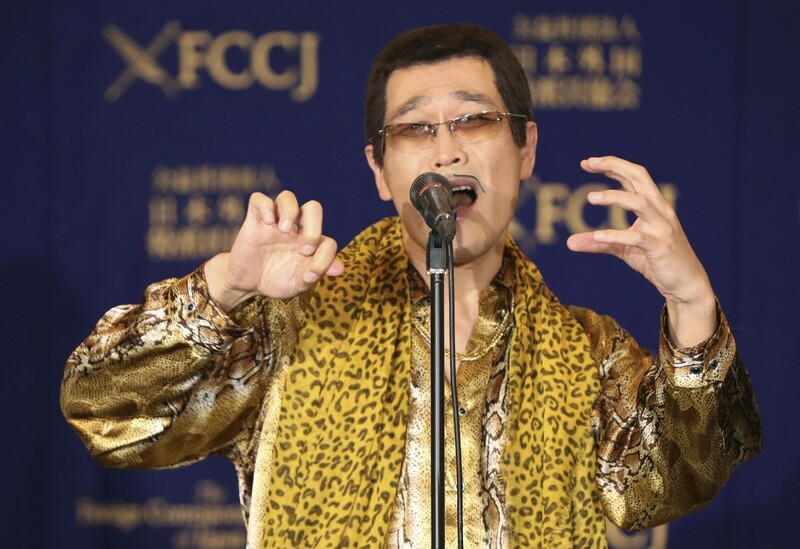 He opened Friday's press conference at the Foreign Correspondents' Club of Japan with what is said to be a world premiere of the "long version" of the PPAP. It lasted about two minutes and involved among other things, fusing two pens together to form a "long pen". He later told reporters that he wanted to see a "mash-up of all the existing different styles out there", saying that the Bollywood-style cover was his favourite. He also threw down the gauntlet to pop artists such as Bieber and Ariana Grande - whom he said he was a huge fan of - to cover PPAP. When asked how his life has changed since his track went viral, he said: "Only one month has passed since PPAP has proliferated. I don't even have my salary yet - I haven't received one yen of revenue from PPAP yet." With a straight face, he added of his "part-time work": "Recently I put horns on a beetle and called it the 'horned beetle'. That's the kind of part-time work I do, and so in that sense my life has not changed at all." In a tongue-in-cheek interview with Japanese public broadcaster NHK earlier this month, he said he conceptualised the tune while he was "eating fruits and facing his computer" one day. "The message of Pen-Pineapple-Apple-Pen is that apples and pineapples can be united if we stick a pen in them, and that we are all riding in one spaceship called earth," he told NHK. "I hope that it will make some money, too." "All I'm trying to do is to write tunes that will put a smile on people's faces and are easy to remember." Piko-Taro has followed up PPAP with another tune, titled Neo Sunglasses. Released three weeks ago, the new 56-second clip has more than nine million views so far. He said at Friday's press conference, drawing laughs from the packed room: "I'm a huge exception in Japan. No one is like me in Japan and I think that is why everybody is laughing at me." He added: "What I will continue to do is to release songs one after another at great speed. They will be fun and interesting and then I will have some famous person tweet about me again." Asked if he had the desire to hold a world tour, Piko-Taro replied in mock horror: "Do you think anybody would want to come? My song is one minute. If I perform 20 pieces, the concert ends in 20 minutes. Or I can talk the rest of the time, or whatever."